Since the outbreak of the civil war in Syria in 2011, Israeli officials have observed events to the north with caution and concern. The concern has derived from the presence of anti-Israel paramilitary and terrorist elements on both sides of the fighting lines in Syria. The caution, meanwhile, relates to the very deep aversion felt in the Israeli system toward the possibility of Israel's being sucked in to the morass of the Syrian war. Israel's Lebanon experience has left a deep institutional memory warning against overly ambitious incursions into the affairs of neighboring states. 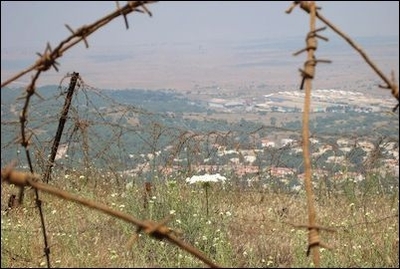 Nevertheless, evidence is emerging of an increasing, though still modest Israeli involvement in events beyond the separation of forces line on the Golan Heights. The least ambiguous evidence of Israeli activity related to Syria is the series of air raids against weapons convoys headed for Lebanon. These have been attributed by foreign media to Israel, and were carried out to prevent the transfer of certain weapons systems from Syria to Hizballah. However, the latest emerging indications relate not to activity deep within the skies above Syria. Rather, the contacts in question are happening, discreetly, very close to the ground, and very close to the border. Israeli officials have observed with concern the recent ebb and flow of the fighting in the Deraa and Quneitra provinces in southern Syria. The rebel fighters in this area, as elsewhere, are a varied and disparate group. The southern front is the focus of the limited western and Arab support offered the rebels. A western command center at which US, Jordanian, Saudi, British and French personnel are present has been established to coordinate aid to the rebels in the south. But the 'moderate' rebels of the Supreme Military Command and the related Syrian Revolutionaries Front, who benefit from the modest flow of western and Saudi aid, are not the only anti-Assad fighters in the south. Jabhat al-Nusra, the official Syrian franchise of al-Qaeda, is also playing a major role in the fighting in the south. The Salafi Ahrar al-Sham group is also present in force among the southern rebels. These groups operate in coordination with the western supported fighters. In recent weeks, forces led by al-Nusra have made major territorial advances. In late April, these forces captured eastern Tel al-Akhmar (the red hill). This hill is situated five kilometers from the Israeli border on the Golan Heights. Western Tel al-Akhmar, which is just 2km from the first Israeli positions, was captured earlier in the month. Rebel forces hope to push on to Quneitra itself. Their intention is to establish a contiguous strip of rebel-controlled territory in across western Deraa and Quneitra provinces – just 100km southwest of Damascus. So the problem is clear. What is Israel doing to respond to it? In addition to increasing drone surveillance and intelligence gathering across the border, the evidence suggests that Israel has established contact with non-jihadi, western supported rebel elements, with the intention of ensuring that the jihadis are prevented from establishing themselves along the ceasefire line on the Golan. The medical care afforded wounded Syrian fighters has served to facilitate this process. 1000 or so Syrian fighters have received this, with the more lightly wounded being treated at the IDF field hospital established close to the border, and others in hospitals in northern Israel. Colonel Abdullah al-Bashir, who commands the Supreme Military Council, a prominent western backed rebel element, was among the military personnel to be treated in Israel. In addition to the direct contacts with the rebels, Israel is also in contact with local leaders across the border, with the intention of offering them inducements to refuse shelter and medical care to the jihadi fighters. The Israeli contacts with the rebels are probably coordinated with the western backers of these forces. According to one report, there are Israeli representatives at the western and Jordanian command center coordinating support for the rebels in northern Jordan. Israeli support for western-backed rebels in this arena is made yet more necessary by the fact that defeat for the rebellion in Deraa and Quneitra runs the risk of bringing not the status quo ante bellum, but rather Hizballah, to the border. Fighters from the Shia Islamist movement are present among pro-regime forces battling in the south. In early March, IDF troops fired at what they said was a Hizballah team trying to place a bomb in the border area. So is the southern border coming to resemble south Lebanon in the 1980s? Is Israel being sucked into another commitment across a northern border? Precisely because the lesson of Lebanon is so deeply etched on the collective memory of the Israeli system, it is likely that the Israeli footprint in southern Syria will remain discernible, but light. There are no ideal options. Nusra, according to one source, is stronger than it appears, since it has allowed pro-western forces to take credit for a number of operations. It does this so as to keep western support flowing into the area, from which Nusra itself will then benefit. So any strengthening of the rebels in the south carries with it the risk of assisting precisely the enemy that it is supposed to thwart. But the alternative of passive acquiescence to either al-Qaeda or Hizballah assembling along the border is probably worse. A complicated political and military eco-system has emerged in southern Syria, just across the ceasefire line in the Golan Heights. Israel will do its best to preserve its vital interests, while avoiding an overt presence in this arena. Maintaining the balance is not simple. As of now, it may be said that Israel is actively, if discreetly, engaged in southern Syria.